This pink moon lamp is adorable and ready to dress up your little girl's bedroom. 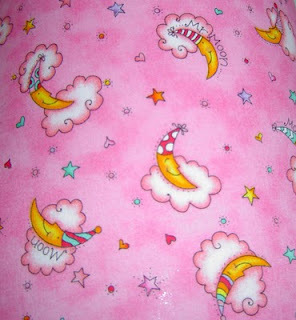 The yellow moons in their nightcaps resting on puffy clouds are surrounded by colored stars and hearts on a light pink background fabric. It is trimmed with 1/4" yellow gimp. The shade is handmade from durable styrene. The inside is white. The lamp measures 21" high, which would be perfect for an accent light or night light on a dresser or desk. The light-weight base is light pink, see-through acrylic and has a six foot gray cord. The metal is silver and the single turn socket accepts a 40 or 60-watt light bulb. 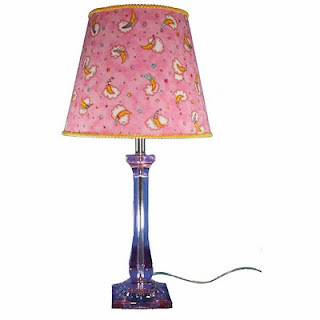 This lamp would give a little girl's room just the right finishing touch. Just wanted to say hi Cindy, your blog is great! And I always say marry a guy who garage sales! He has a great eye.